A strike now completing its fourth week at Ssangyong Motors in Pyeongtaek, South Korea, remains a standoff as of this writing. The strike echoes in many ways the dynamic seen in the recent Visteon struggle in the UK and in battles over auto industry restructuring around the world. Involving, on the other hand, an outright factory seizure and occupation, and preparation for violent defense of the plant if necessary, it is the first struggle of its kind in South Korea for years. The company was taken over three years ago by China’s Shanghai Automotive Industry Corporation, which holds 51% ownership. At the time, the Pyeongtaek plant had 8700 employees; it now has 7000. In February the company filed for bankruptcy, proposing a restructuring and offering the Pyeongtaek plant as collateral for further loans to re-emerge from bankruptcy. The court approved the bankruptcy plan, pending adequate layoffs to make the company profitable again. Workers at the plant responded with strikes against pending layoffs in April which accelerated into a full strike and plant takeover and occupation by 1700 workers on May 27 when the list of workers to be laid off was announced. The strike focused on three main demands: 1) no layoffs 2) job security for all and 3) no outsourcing. The company wants to force 1700 workers into early retirement and has fired 300 casuals. As of mid-June, about 1000 workers were continuing the occupation, with wives and families providing food. About 500 workers not slated for layoff are staying at home, and about 1000 supervisory staff are scabbing, mainly maintaining machines, while no cars have been produced since the occupation began. There has been to date little mass police presence in Pyeongtaek. This is due at least in part to to the current political crisis in South Korea following the recent suicide of ex-president No Mu Hyeon and subsequent large-scale demonstrations expressing growing outrage against the current right-wing government of Lee Myong Bak, demonstrations that are expected to gain momentum into July. The Lee government, elected in December 2007 on a program of high economic growth and now discredited by the world crisis, has been taken aback by the depth of outrage revealed in demonstrations mobilizing up to 1 million people. After the unleashing of riot police provoked further outrage and brought more people to the streets, the government is unwilling to risk further disenchantment by an assault on the Pyeongtaek factory. On June 16, a large anti-strike rally of more than 1500 people was held outside the factory gates. The rally was attended by the 1000 supervisory scabs, 200 hired thugs and 300 workers not on the layoff list and not supporting the strike. 400 riot police stood by, doing nothing, and finally declared the scab assembly illegal. During the scab rally, about 700-800 workers from nearby factories, such as the Kia Motor company, came to defend the Ssangyang plant, in part in response to a text message tree of the KMWU. The occupying workers have made plans for armed defense against any police attempt to recapture the plant, stocking iron pipes and Molotov cocktails. As a further fallback plan, they intend to concentrate in the paint department, where the flammable materials (in their estimate) will dissuade the police from firing tear gas cannisters and setting off a conflagration. According to one activist critical of the role of the union, the KMWU seems to remain in control of the strike. In contrast to role of the unions in the Visteon struggle in the UK and in the dismantling of the US auto industry, the KMWU has thus far supported the illegal actions of seizing the plant and preparing for its armed defense. On the other hand, it has been concentrating on the demand for no layoffs and soft-pedaling the demands for job security for all and against out-sourcing. The core occupation of the plant is powered by 50 or 60 rank-and-file groups of 10 workers each, who in turn elect a delegate (chojang) for coordinated action. 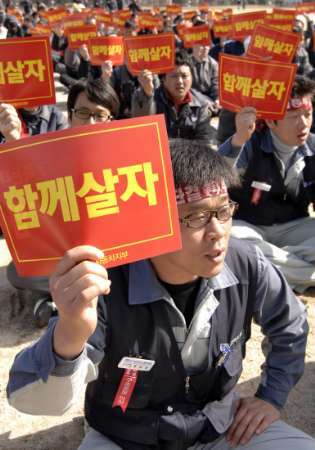 According to the same critical activist, these chojang are the most combative and class-conscious workers. The outcome of this strike remains up in the air. It benefits from a momentarily favorable political climate, which has put the Korean government on the back foot, but it is up against the deep crisis of the world auto industry and the world economic crisis generally. The nearby Kia Motor Company plant is itself in the middle of critical negotiations for crisis measures, and GM-Daewoo is being hit with the world reorganization of GM. The company strategy, as in the case of Visteon, seems to be at best slow attrition (already underway since 2006) or even an outright closing of the plant. The Ssangyong Motor struggle may light a fire in the Korean auto industry and beyond, or, more likely, be strangled, slowly or not so slowly, in its current isolation.